At Southland Christian Church, they've just gone through a transition in which the senior pastor Mike Breaux handed off his position to an associate pastor named Jon Weece. This promotion made the front page of the Lexington newspaper. Danielle's mom took me and Danielle to see Jon preach last night, his debut service as senior pastor of Southland Christian. 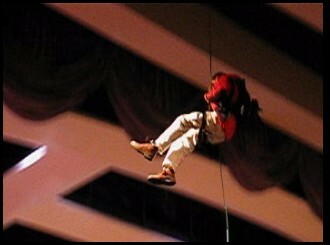 I took my camera so that I could capture some quick footage of him descending from the rafters. Shown above is a screenshot from that footage (which is too big to post here). Cool deal, that.